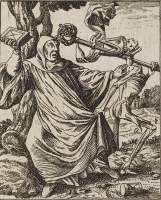 fficially the abbot has renounced this world and its temptations, but that doesn't prevent him from being rather portly, nor from fighting for his life. 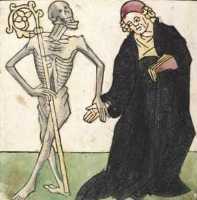 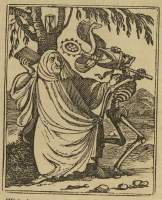 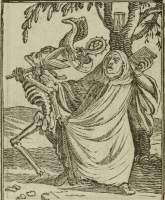 Death has taken ownership of his cap (mitre) and staff (crozier), and drags the abbot away, while the abbot is about to strike with his prayerbook. 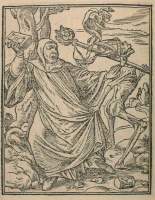 Holbein has taken the basic idea — Death stealing the staff from an Abbot in a long, black cloak with a heavy book — from Heidelberg's block book (picture to the left). 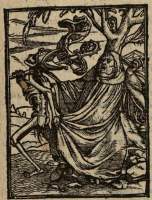 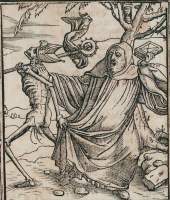 But Holbein's execution is far more dynamic, with Death turning his back to the victim and carrying the staff over his shoulder — and this has in turn inspired the dance of death in his own hometown, Basel. 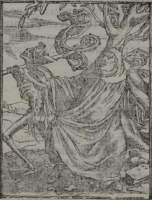 In Basel (probably after a renovation in 1568) Death takes the cook's skewer over his shoulder and drags him away. 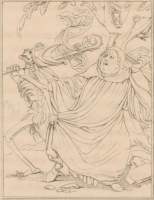 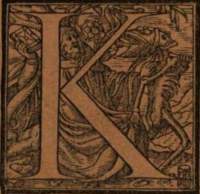 Variations: Aldegrever makes a very free interpretation, but in this one case Eberhard Kieser chooses to copy Holbein instead of Aldegrever. 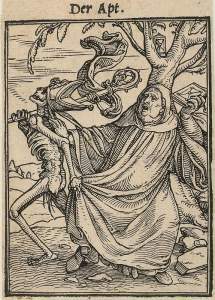 Birckmann has made the abbot younger and slimmer and given him a new face; instead of being fat and startled, he's slim and aggressive; the hourglass has been set on the ground. 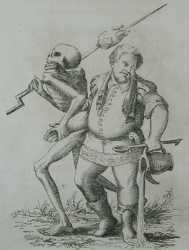 Birckmann's changes are copied by Valvasor, Hollar and Deuchar.